A year ago we boarded a plane to Buenos Aires. We were excited to travel again, explore a new culture, and add a stamp to our passports. We looked forward to warm weather, new sights, and towering snow-capped mountains. The mountains of Perito Moreno would mark the fifth set of glaciers we’ve hiked throughout our many years of travel. In the summer of 2015, Ed started tripping and spitting. His speech was slurred at times. After several consultations, MRIs, and CAT scans, the diagnosis was a big slap in the face of our otherwise comfortable lives. I remember the second neurologist saying “ALS,” but I still was not comprehending. We gathered ourselves and headed to the local coffee shop to both eat comfort food and find comfort in each other’s arms. We cried many times, together and alone, but decided right away that we needed to change our life. We chose to live—and live large. While we made that decision without hesitation, it also meant we were venturing into a sea of uncharted waters. While Ed was enjoying a nine-month sabbatical at the time of diagnosis, I was still teaching math fulltime. From the moment we met thirty-five years earlier, we’d traveled; that’s what we’d planned for our eventual retirement. We thought that was light years away. But this news was a game changer. My first interaction with ALS was learning about Coach (and teacher) Charlie Wedemeyer at Los Gatos High. His remarkable story is well known and our principal is still friends with his now-adult children. Granting my leave of absence was her way of doing whatever she could to ease our burden. She did so without hesitation. Ed made his bucket list. I added places here and there, but if all went as expected, I would be able to travel to my spots after Ed was gone. We were both glad we’d started our travel nest egg decades prior. Now was the time to spend our time and money together. We knew that surviving ALS was not an option, yet Ed never once nodded in death’s direction. And while the disease wrecked certain aspects of his life, we grew into our new circumstances with grace and humor, wit, and all the positive energy we could muster. looking at trees blooming and the sun setting brought a smile to Ed's face. 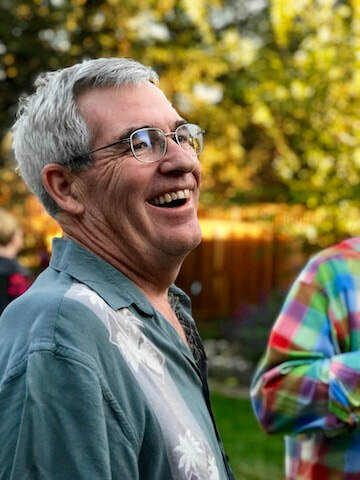 In the two and a half years between Ed’s diagnosis and eventual passing, we crisscrossed the United States, camped in Wyoming to see the solar eclipse, and traveled to Portugal, Costa Rica, Germany, Austria, Czech Republic, Ireland, Iceland, Mexico, and Argentina. I won’t mislead you here—traveling with ALS can be one of the greatest challenges you will face. But the reward is so great. You do have to think about basics, such as wheelchair services at both ends of all flights, longer security checks, traveling with enough liquid food for not just the flight but also for a few more days in case your luggage gets lost. You may have to interpret answers for your loved one because security may ask questions when they no longer have the ability to speak. Everything takes longer and seems an extra challenge, such as using a feeding tube syringe on an airplane. And don’t forget to have superhuman strength—or get an airport porter—to help with the extra pieces of luggage carrying liquid food. You may need to arrange for a wheelchair at the hotel. Look for hotel services that really address your needs and those of the diagnosed. 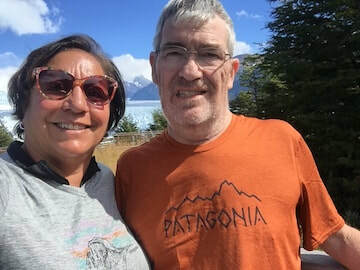 In El Chaltén, (where I met David, Director of Your ALS Guide), we found a fabulous hotel where I could hike for hours and Ed could look out full-picture windows at those same dramatic snow-capped mountains while reading and being comfortable. ​We returned home from Argentina and Ed passed away a month later. For all the fear and anxiety I had going into our last big trip, I was so much more at peace by the end. I was never going to cure Ed and his ALS, but I am thankful knowing I pushed myself to make his life a little better. And when he passed, while still painful, I found comfort and solace knowing we got to do a little of what we’d planned to do so many years ago. Do you have an ALS story you'd like to tell? We'd love to hear from you. You can write your own story, or we can help you tell it. Just send us a quick email at info@youralsguide.com to get started.